Going green on the range is a thing now. And it’s not just for environmentalists. The improvement in shooting conditions for the shooter are immense. The simplicity of the small design changes and the ease of integration for the shooter make this an easy transition too. 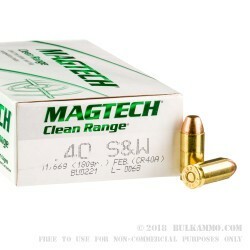 The Clean Range line from MagTech is not a lead-free load, but it is a significantly reduced lead exposure round. 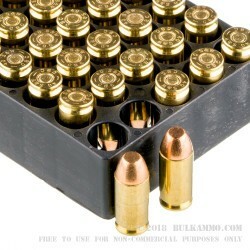 In fact, it’d be hard to be exposed to lead at all by using this ammunition. It features a fully encapsulated base projectile that won’t allow the lead projectile core to come in contact with the hot burning gases of the powder charge as it is ignited. The lead-free primer reduces airborne particulate matter in the shooter’s area. 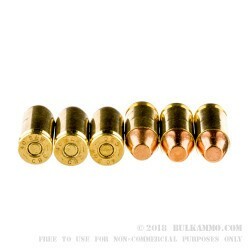 The otherwise very vanilla range type load is a 180 grain projectile in a brass cartridge casing that has a Boxer primer. The round will easily perform in any mainstream production firearm that shoots .40 S&W ammunition. The MagTech brand has been making great strides towards producing more and more innovative cartridges in their product portfolio, and this is a big win for those who are ready to make the move. As more adopters join the transition to the lead free shooting experience, MagTech is poised to be a great offering in the market across the calibers it caters to in production. Q: What is the difference between this product ( 180 grain fully encapsulated base (FEB) ) and the 180 grain flat-nose full metal jacket (FMJ)? Visually they appear identical yet the FEB ammo is considerably more expensive for one 50 rd box. Thank you! 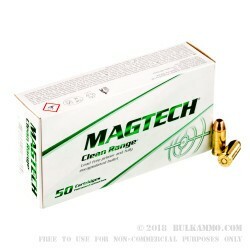 A: The Magtech CleanRange FEB ammo uses lead free primers and fully encapsulated bullets to reduce airborne lead levels. This is important for indoor ranges that need to deal with airborne lead regulations. Because of the increased complexity of manufacture, this ammo sells for more than standard loads with lead styphnate primers and exposed lead base (FMJ/FMC) bullets.